A skills gap that could leave as many as 2 million manufacturing jobs unfilled by 2025 is one of the driving forces behind a new Clemson University program that for the first time matches graduate students with technical college students on an assembly line built for research. The new program, THINKER, is the first in the nation to bring together graduate students and technical college students in an advanced manufacturing program centered on education and research. It is backed by $3 million from the National Science Foundation and is aimed at creating well-prepared leaders who can help close the skills gap in advanced manufacturing. By goring through the program, those leaders will understand the interaction of machines, people and data, organizers said. Economic expansion and baby boomer retirements will likely create a need to fill 3.4 million manufacturing jobs in the nation between 2015 and 2025, but only 1.4 million are likely to be adequately filled, according to a study by Deloitte and the The Manufacturing Institute. It's a crucial issue for South Carolina, where the U.S. Bureau of Economic Analysis says manufacturing accounts for 17 percent of the economy, which is more than 50 percent higher than the national average. 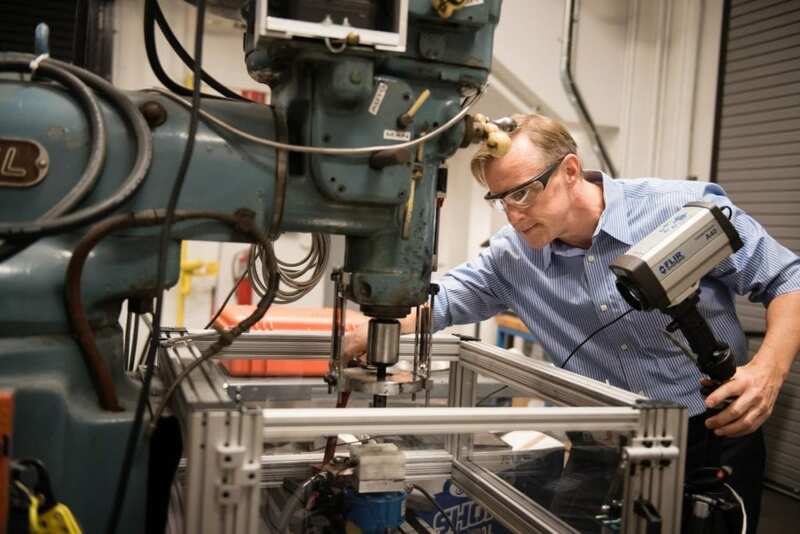 Clemson is responding with a portfolio of research, education, and partnership programs, including THINKER, that are coming together under the Clemson University Center for Advanced Manufacturing. THINKER is an acronym for Technology- Human INtegrated Knowledge, Education and Research. The program will equip students with both technical skills and "soft skills," such as communication and collaboration. The leaders the program aims to create are in high demand and could help attract new businesses to South Carolina, while supplying businesses already in the state with the talent they need to grow. Laine Mears, the BMW SmartState Chair in Automotive Manufacturing at Clemson, said the THINKER team will be creating a new national model for graduate education. "We do that by putting students into a manufacturing environment and teaching them how people and technology work together and how new technologies can emerge to support that vision," he said. The impact could quickly ripple through the broader regional economy. Every job in manufacturing creates another 2.5 jobs in local goods and services, and for every $1 invested, another $1.37 in additional value is created in other sectors, according to the study by Deloitte and The Manufacturing Institute. Graduate students who enroll in THINKER will lead teams of undergraduate and technical college students in research projects suggested by industry. The idea is to recreate the dynamics that come into play when researchers, engineers and technicians collaborate on projects in actual factories. The teams will focus their research on connecting human workers and internet-connected machines that are often loaded with sensors and generating massive amounts of data. A wide range of research projects could be involved, such as developing new manufacturing processes or creating wearable devices that give workers feedback to improve quality. Students will conduct their research at the new Clemson Vehicle Assembly Center, a research assembly line that replicates a real-world car factory. The facility is housed within Greenville Technical College's Center for Manufacturing Innovation. David Clayton, the executive director of the Center for Manufacturing Innovation, said the collaboration underscores the depth of cooperation between the institutions on an issue crucial to South Carolina's economic well-being. "This program will accelerate what is already one of the fastest-growing manufacturing industries in the country," he said. "Greenville Technical College students will have a unique opportunity to advance their education in an environment that closely replicates what happens in an advanced-manufacturing setting, giving them an advantage in the job market. Further, our students, who often have experience in manufacturing, will be well positioned to inform graduate students' research." In addition to research, graduate students in THINKER will be required to take a course on collaboration, and cross-disciplinary technical courses in each of three key areas: manufacturing, data and human integration. Plans call for 25 master's students and 25 Ph.D. students to complete the program over the five-year grant period. A plan is in place to keep it going after that. While undergraduates and technical college students will be involved, the National Science Foundation funding is reserved for graduate students pursuing degrees in science, technology, engineering and math. Those students will also have to continue to meet the master's and Ph.D. requirements for their home departments. What will set them apart at graduation is a special designation showing they have completed the THINKER program in addition to their regular master's or Ph.D. work. "This is holistic approach to engineering education, combining both technical and soft skills that are in high demand in a modern workplace," he said. "THINKER graduates will understand multi-hierarchical leadership, communication and how to manage the integration of people with new digital manufacturing technologies in a rapidly evolving environment." The program also presents unique opportunities for advancing education research. Debi Switzer, co-principal investigator on the grant and chair of the Department of Education and Human Development at Clemson, said her team will research what it takes to empower individuals so that each feels he or she has a voice in a team of diverse educational backgrounds. Switzer was also drawn to the opportunity to make sure students can apply what they learn to any setting. "Discovering new ways of empowering individuals to have a voice — no matter what the makeup of the team– will add to the literature in every aspect of human endeavor where teams are necessary," she said. "That is a 21st-century skill." Mark Johnson, the founding director of the Center for Advanced Manufacturing, said the THINKER program will help South Carolina maintain its competitive edge. "The skills and knowledge that students learn in this program align with industry needs, both today and for the future" said Johnson, who is also the Thomas F. Hash '69 SmartState Endowed Chair in Sustainable Development. "This holistic approach will educate the leaders of tomorrow who will power innovation and economic growth from the start." Mears is the principal investigator on the grant, which comes through the National Science Foundation's Research Traineeship. Co-principal investigators are: Joshua Summers professor of mechanical engineering; Switzer; Laura Stanley, associate professor of industrial engineering; Amy Apon, chair of the Division of Computer Science in the School of Computing; Nathan McNeese, an assistant professor in the School of Computing; Farbod Akhavan Niaki, research assistant professor of automotive engineering; Kris Frady, assistant professor of education; and Dani Herro, associate professor of education. A joint statement on the program was issued by Tanju Karanfil, vice president for research, and Jason Osborne, associate provost and dean of the graduate school. "We are excited that this program will provide new opportunities to recruit the best students and broaden the graduate student pipeline," they said. "This is an excellent opportunity to take Clemson's research enterprise to the next level, while promoting economic development for the state." Anand Gramopadhye, dean of the College of Engineering, Computing and Applied Sciences, congratulated the team on the grant. "This grant will help educate the next generation of leaders through convergent research, equipping them with the skills necessary to tackle the complex problems in advanced manufacturing," he said. "The amount of the award is a testament to the high level of scholarship and the critical need it addresses."